AIM: to programme and develop networked iPads to enable beginner music readers and non-music readers to perform complex polyphonic music in ensembles, with and without professional musicians. Research shows that ensemble performance participation raises self-confidence in children and adults. However ensemble music-making grinds to a halt when non-music readers participate – with the result that they feel excluded. Could networking technology transform ensemble music-making so that more people can benefit? We think it could in three areas: music education, community music-making and also in the future by stimulating creative possibilities including composing tools. In our initial project, we’re focused on the possible benefits to a primary school orchestra, where the system is currently under trial over five weeks and is receiving promising informal feedback from the students and the teacher. 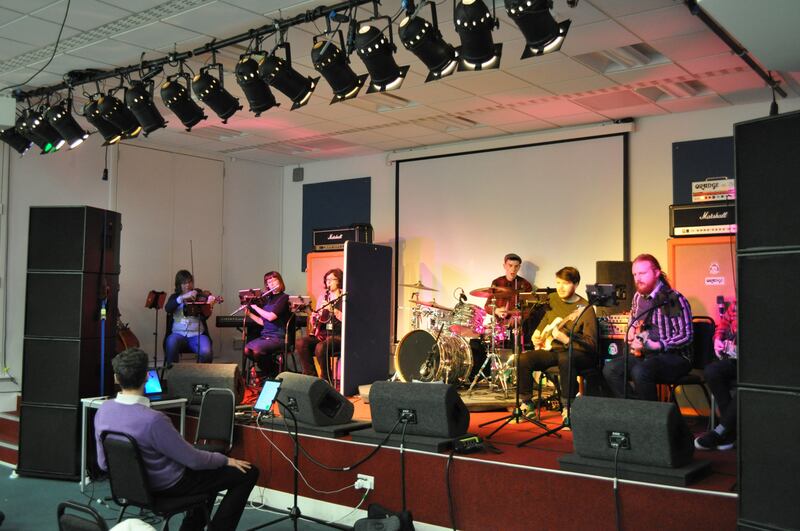 In addition the system has been successfully tried in one off sessions at BIMM and East Sussex Academy of Music, where its potential for development has also been recognised. In the future we’re interested in exploring the system’s impacts in a wide range of settings. Our dream is a system that can render a range of music swiftly in a wireless setting using the most powerful combinations of traditional and modern notation with digital technology to facilitate ensemble performance. A prototype digitally interactive wireless glove for music direction has already been devised for experimental testing and will be viewable at this pilot’s final public demonstration working with CoMA Brighton at the Brighton Science Festival on 21 February 2016 at 3pm. We think this system may soon contribute to bridging gaps between acoustic and electric forms of ensemble performance – but for now we’re focussing on a primary school orchestra case-study. We’re working with colleagues in Psychology in order to explore how the benefits of technology may be effectively evaluated in this type of project, especially on a larger scale.